Does a vocational qualification give you better career prospects than a university degree? Home > News & Events > Blog > Does a vocational qualification give you better career prospects than a university degree? Whether you’re fresh out of high school or simply looking for a change in career, choosing your pathway to success is a decision worthy of serious thought. You want your chosen tertiary education to set you up for career success after graduation and in the long-term. What’s the difference between vocational education and university degrees? Time: A typical bachelor’s degree requires around three years of study. VET programmes are often shorter than this, calling for anywhere between six months and two years. Focus: While VET courses are shorter, they do not offer less education. Rather, the topics of study are specially catered to create clear pathways to the associated industries. Many university degrees will cover a broad range of subjects and offer little specialisation until the last years of study, or in post-graduate degrees. Assessment: University programmes generally follow the formal examination structure, basing grades on performance during assessments or end-of-semester exams. Meanwhile, VET grading looks at your competencies – using ongoing assessment to determine which skills you are competent in or need further training for. Experience: Some universities may include short term work placements in related industry organisations to encourage students to form career pathways. However, VET programmes don’t only feature work placement, they are based around it. With vocational training, you will often be placed in a paid industry role and supported by formal education a few days a week. Price: Fees for VET programmes range from $4,000 to $22,000, according to Study in Australia. Meanwhile, undergraduate bachelor’s degrees are more expensive, ranging from $15,000 to $33,000. How does a vocational qualification give you real skills? Being uniquely designed for specific industries and roles, VET courses develop directly applicable skills for your chosen career path both in the classroom and at your industry placement. With your education running concurrently to your paid placement, you’ll be able to immediately turn theory into practical skills by applying them at work. You’ll also be able to deliberately nurture your soft skills – unique competencies that can’t be easily graded but are vital to many industries, especially hospitality management. A huge 82.2 per cent of employers believe nationally recognised VET qualifications provide employees with the right skills needed to excel at their jobs, according to the National Centre for Vocational Education Research, meaning potential employers are likely to respond positively to a VET qualification on your CV. How can you gain real career experience through tertiary education? Kenvale College graduates enjoy a 100 per cent employment rate following completion of their qualifications. As mentioned above, industry placements do feature in some university degrees. However, all VET programmes are based around real workplace experience. For example, Kenvale’s work-integrated learning runs concurrently with your formal education. You will begin work in a paid industry role at the start of your course and work approximately 20 hours per week as part of your studies. This helps you balance the cost of living with full-time study, but also means you gain real-world experience in your chosen industry. Recently, many employers have made a shift to prioritise experience over education, resulting in roughly a quarter of university graduates being unable to find career related work in the first four months following their degree, according to Graduate Careers Australia. Meanwhile, Kenvale College graduates enjoy a 100 per cent employment rate following completion of their qualifications. Where can your choice of tertiary education lead your career? University degrees and vocational qualifications both offer long-term career benefits. That said, VET qualifications can be considered to offer better return on investment for your time. Being integrated with the workforce and consistently faster to achieve than university degrees, VET qualifications get you into the workplace much sooner than a degree does. This means you have immediate potential to start seeking career growth opportunities. You’ll also be just as able to seek higher level education later in life if you so choose, as VET qualifications pathway into university degrees. With a VET Diploma or Advanced Diploma qualification, you can achieve up to 18 months advanced standing of a three year undergraduate bachelor degree. VET graduates with four or five years industry experience often choose to go directly into a postgraduate qualification. Universities look at your VET qualification and your industry experience, and recommend that you enrol in a postgraduate certificate or diploma before continuing to complete your master’s degree, if you wish. This is another example of how VET, and industry experience and advancement, can quickly propel you up the career ladder with a master’s qualification. Do university degrees or VET qualifications help you earn faster? Consider the cost of course fees. VET programmes are typically more affordable, and some courses (including those at Kenvale) are available for Smart & Skilled Funding, providing domestic students with subsidised fees. This means you can spend less for the same or greater value education to kickstart your career, thereby incurring a smaller student loan. With fewer debts, you can start saving to fulfill your dreams sooner – giving you a head start over university graduates! Kenvale College offers VET courses in hospitality, commercial cooker and event management. 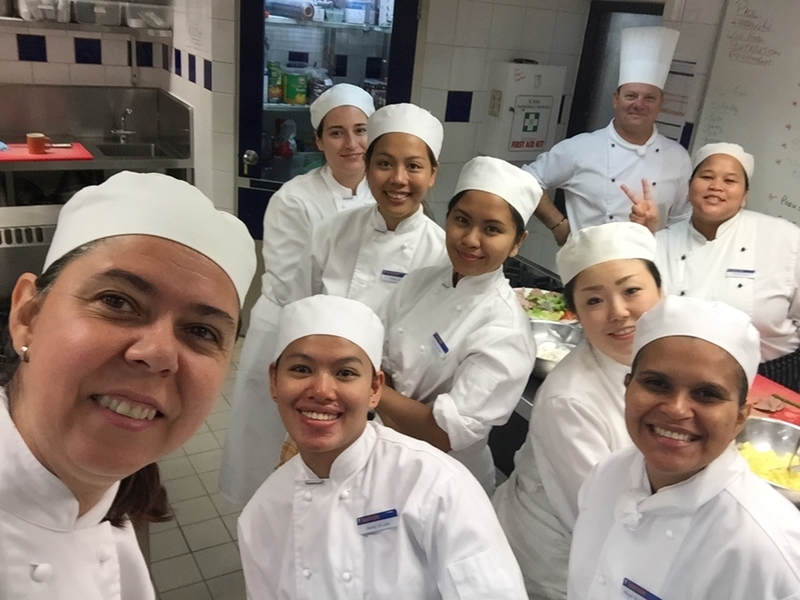 As a not-for-profit college, our mission is to develop real skills in all of our students and create an investment in the future of Australia’s hospitality workforce. Through a combination of paid industry placements and full-time or part-time study, we will equip you for lifelong career success. There are so many reasons to choose a vocational qualification to kick-start your career. With a 100 per cent employment rate, Kenvale College is the best place to equip yourself for lifelong success. To find out more about our courses, get in touch today. 5 reasons 2019 is the perfect time to start a vocational qualification Want a career in events? Here’s what to look for in a qualification What is VET in Australia? (and why you should care about it) How are my career prospects shaping up in the Australian hospitality industry?